This photo was taken in France at the seaside in Normandy, near where my Grandparents have a house. 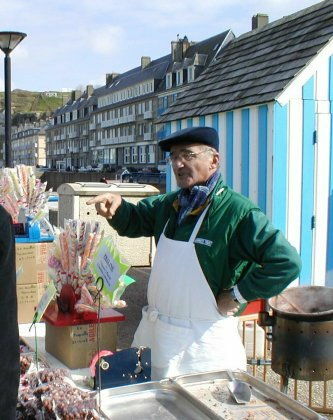 This old French guy has set up his sweet stall by an old changing hut, and it looked quite quaint so I took a picture! I had to crop it because my cousin is in the other half asking the guy a question – that's why he's pointing!